The 16 species of penguins found in the southern hemisphere are all flightless birds adapted for an aquatic existence. Penguins are insulated from the frigid ocean water by three layers of short, dense feathers and an underlying layer of fat. The wings are modified into stiff flippers for rapid swimming under water, while the webbed feet are used together with the tail as rudders for turning. Most penguins have a white breast and a black back and head. Many species exhibit red, orange, or yellow patches on the head and neck. Because their short legs are placed far back on their bodies, penguins assume an upright posture. Penguins are grouped into 18 species and 6 genera, most of which are found in Antarctica and on subantarctic islands. Others are native to the coasts of Australia, South Africa, and South America and to the Galápagos Islands. The largest species are the king penguin, from 91 to 97 cm (36 to 38 in) in height, and the emperor penguin, which may attain a height of more than 120 cm (48 in). Both species are found on the Antarctic ice barrier. 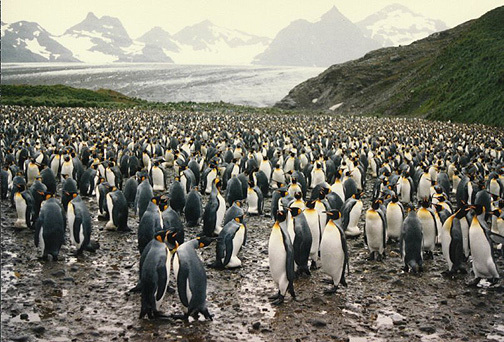 The king penguin is also found in Tierra del Fuego and on eight islands in the southern hemisphere. The smallest penguin is the little blue penguin of Australia and New Zealand; its height is 41 cm (16 in) or less. 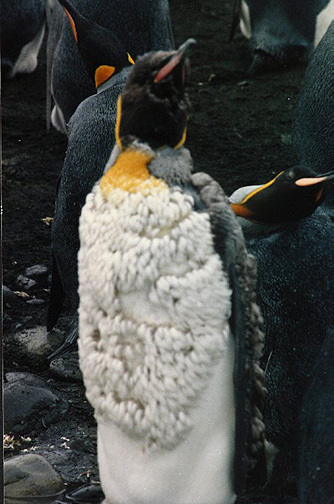 Unlike most species, the king, emperor, and little penguins have blue-gray backs. Another distinguishing feature of the king and emperor penguins is the presence of bright reddish or pinkish shields on the sides of their mandibles and large orange or yellow patches on the sides of their necks. The yellow-eyed penguin and six other species have yellowish feather crests on the sides of their heads. 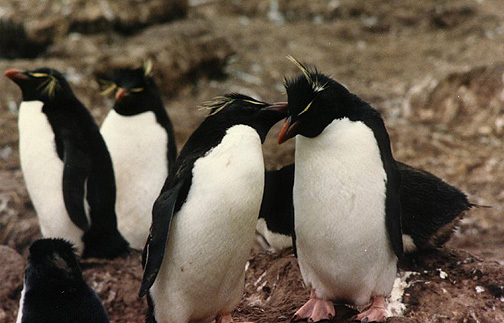 These six species inhabit the Antarctic waters south of New Zealand and Tasmania and range northward along the east coast of South America and to Tristan, an island in the South Atlantic. 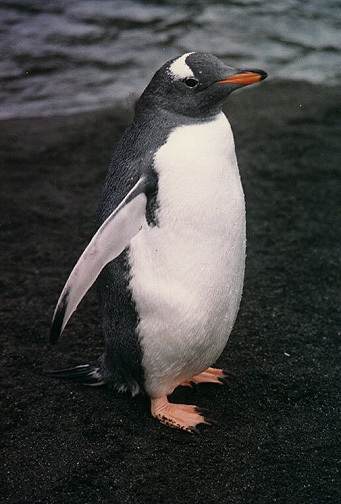 The gentoo penguin and the Adélie penguin are found in Antarctica and in the South Shetland, South Orkney, and South Sandwich islands. 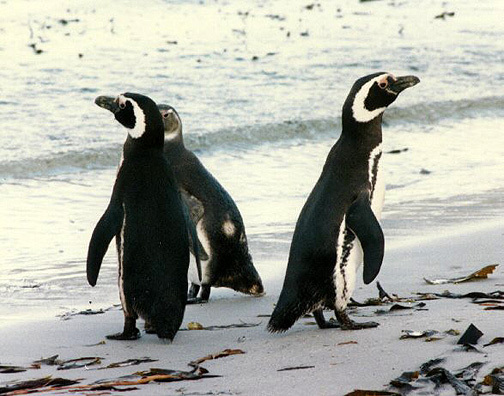 The jackass penguin is found off the coasts of South Africa. 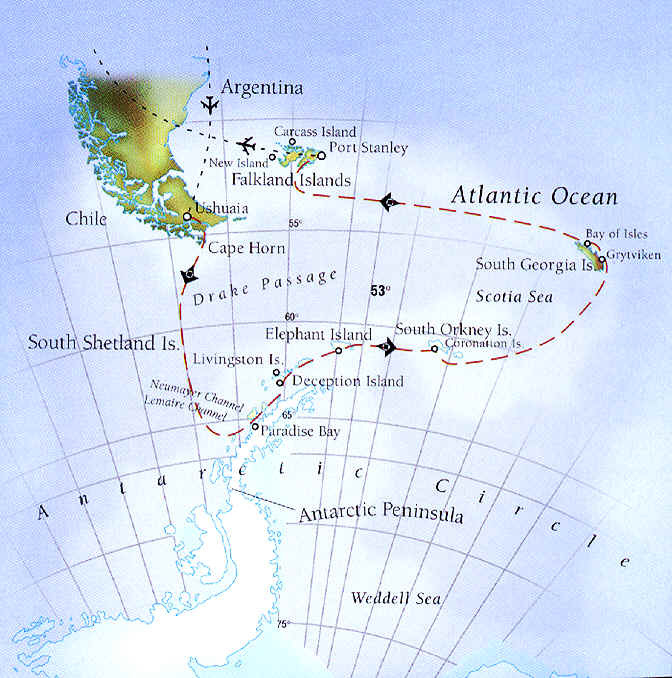 The cold Humboldt Current along the west side of South America permits two species to breed in what are otherwise tropical latitudes: the Galapagos penguin on the Galápagos Islands, and the Humboldt penguin on the South American coast and offshore islets. Although descended from flying ancestors, penguins have become highly specialized for swimming; their stiffly held wings resemble the paddles of other swimming vertebrates. Penguins do not have specific feather tracts, as do most birds, but are covered almost uniformly with small, scalelike feathers. Whereas most birds shed their feathers and grow new ones during a relatively long period of the year, penguins molt all of their feathers and, in some species, even shed the shields from the beak within a short space of time. 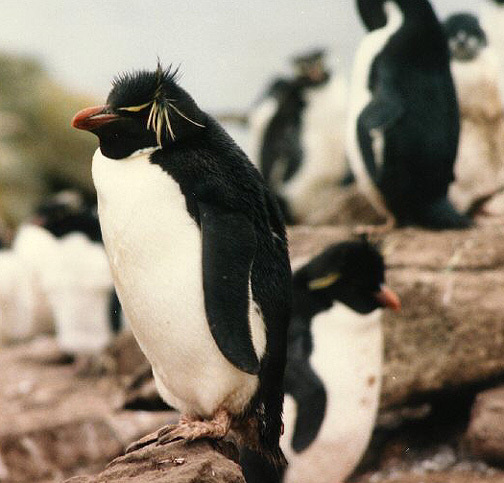 A molting penguin has a swollen, disheveled appearance; it loses its feathers in huge patches as new feathers appear. During the molting period, which may last several weeks, the penguin does not enter the water to feed. The ability to withstand intense cold is one of the penguin’s greatest assets. Most penguins have rather small feet, wings, and heads; the relatively little surface area in comparison to the bird’s volume results in excellent heat conservation. In addition, many penguins have a thick insulating layer of fat under the skin. Some species are better equipped for cold weather than others. The emperor penguin, which may weigh 27 to 32 kg (60 to 70 lb), appears to be the best equipped of all. Penguins usually walk or hop and toboggan along on their breasts, pushing with wings and feet. They swim with great speed and agility. The flippers are their sole means of propulsion; the feet are trailed behind or used in steering. Some species progress by porpoising, which is swimming underwater some distance, emerging in a graceful arc to take a fresh breath, and submerging again. Penguins feed on fish, cuttlefish, crustaceans, and other small sea animals. In captivity the king and emperor penguins normally do not learn to pick up their own food, and after they have been taught to feed by strenuous forced feeding they must be fed by hand each day. Penguins are gregarious birds and are found in flocks even at sea. On land the colonies often number in the hundreds of thousands. Although the birds have suffered greatly at the hands of humans, who have slaughtered great numbers for their blubber and, more recently, for their skins, the inaccessibility of the Antarctic region has helped preserve the group. 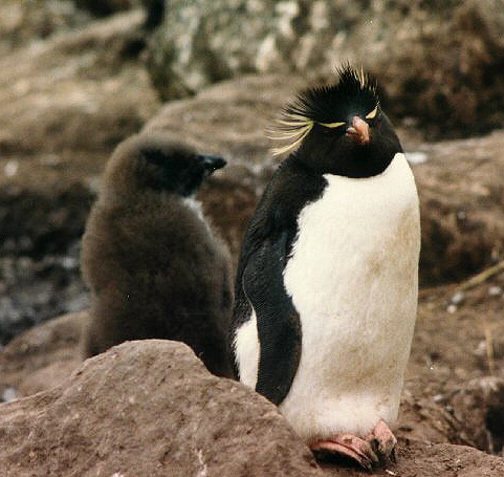 Natural enemies of the penguin include leopard seals, killer whales, and, in the case of young chicks and eggs, skuas. 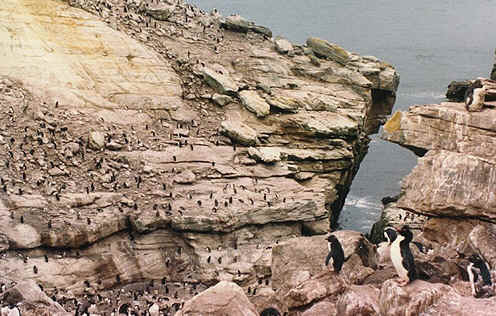 The greatest concentrations of penguins are seen in rookeries where the birds gather to breed. 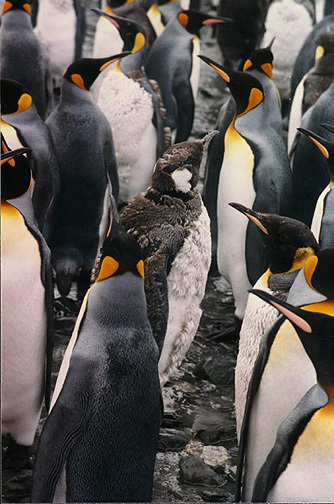 Several species of penguin may be found nesting in a single rookery, but usually the species are well segregated. At the mating season the penguins of the Antarctic region appear along desolate, ice-bound, or rocky coasts and hop, jump, waddle, and toboggan toward favored breeding sites. In many of these areas smooth paths have been worn over hard rock formations by countless generations; the birds use precisely the same paths as their antecedents to approach the rookery. Often the paths seem to be the most circuitous and difficult routes to the rookery, and in some cases the sites are located many kilometers from the ocean. More northern species may be resident in the area of the rookery. The emperor penguin breeds in one of the world’s most inhospitable regions during one of the coldest periods of the year, laying and incubating its eggs in temperatures as low as -62° C (-80° F). Penguins indulge in strange postural displays and calls in the process of finding mates within their own species. 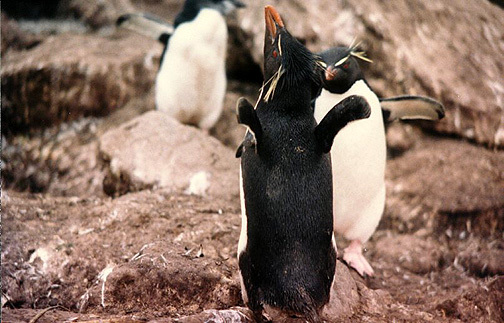 The gentoo penguin raises its flippers and calls or bows in a manner peculiar to the gentoo; the jackass penguin bows, shakes his head, and brays in a characteristic jackasslike call; and the courtship display and clear trumpeting of the king penguin are specific to that species. 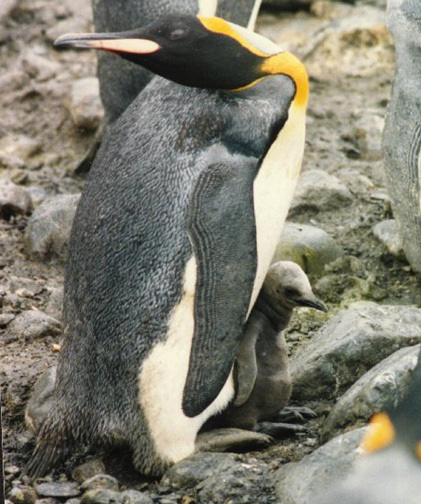 Penguins vary in their nesting methods, and some species build no nests at all. The Humboldt and jackass penguins prefer a sheltered retreat, such as a burrow, and utilize sticks and other debris to form the nest. Others, such as the Adélies, incubate their eggs in the open on nests formed of stones or sticks. 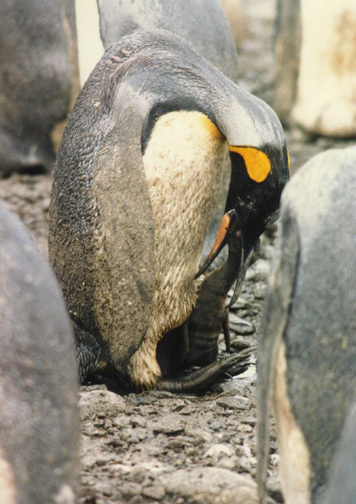 King and emperor penguins build no nests; in these species the bird holds its single egg in the top of its feet, hunching down over it so that a fold of abdominal skin covers and warms the egg. Most species of penguin lay a clutch of two eggs, which are white or greenish in color. Incubation periods vary according to species. 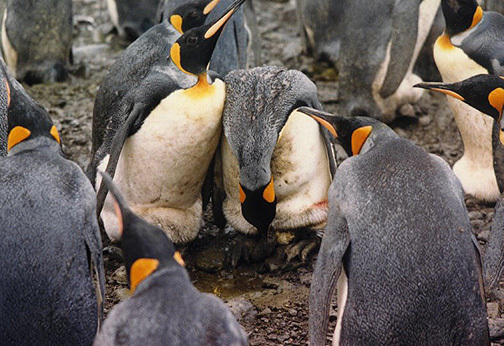 King penguin eggs require more than 50 days of incubation before hatching, whereas jackass eggs hatch in 32 to 36 days. In general, both sexes incubate the eggs and feed the young. The male Adélie penguin usually incubates the eggs for the first two weeks, fasting, while the female returns to the sea to feed and bathe. The male has been known to fast during the entire time that the nesting territory is established and defended, courtship takes place, and the eggs are laid and incubated. When the female takes its turn at the brooding, the male goes to the distant sea to feed and, within an amazingly short period, restores its reservoir of fat and returns to the rookery with food for the young soon due to hatch. 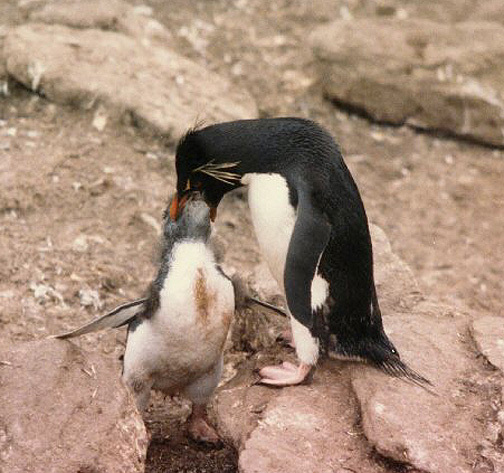 Both parents share responsibility for feeding the young penguins. 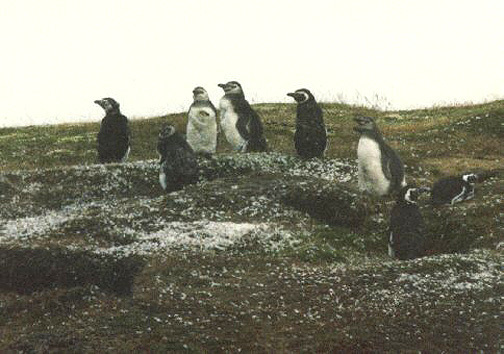 Not all species of penguin undergo such strenuous fast periods during the breeding period as do the Adélies; many nest in areas where the birds can make several trips daily to the sea for food. 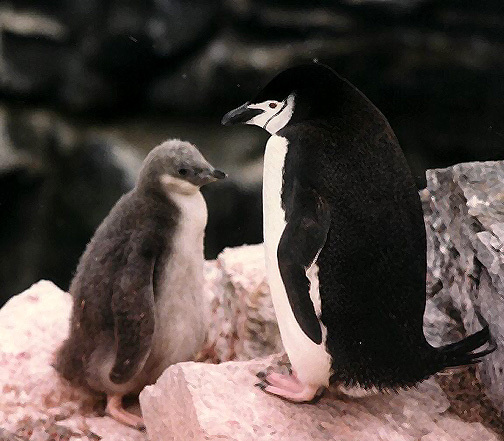 Most penguin chicks are covered with a sooty-gray down at hatching, although some have a pattern of soft grays and whites. Chicks of certain species remain confined to the burrow or nest through the entire nesting period, during which they are fed by their parents. Among other species the chicks, after reaching a stage of development in which they do not require constant care from the parents, are grouped in areas called nurseries. There they wait until the parents hunt for food. 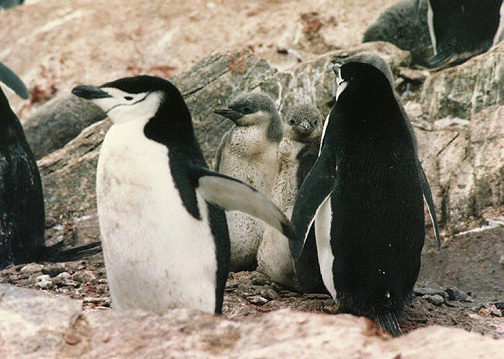 On their parents’ return, parents and chicks recognize each other in a group often numbering thousands. In some cases there ensues a feeding chase in which the chick leaves the nursery to chase one of its food-laden parents. The parent finally stops and regurgitates partially digested food for the chick. After a young penguin has shed the last of its down and acquires its first plumage, it enters the sea to fend for itself. Scientific classification: Penguins make up the order Sphenisciformes. 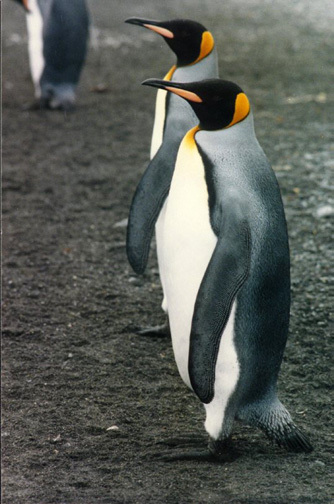 The king penguin is classified as Aptenodytes patagonica, the emperor penguin as Aptenodytes forsteri, and the little blue penguin as Eudyptula minor. The yellow-eyed penguin is classified as Megadyptes antipodes; the six other species that have yellowish feather crests on the sides of their heads make up the genus Eudyptes. 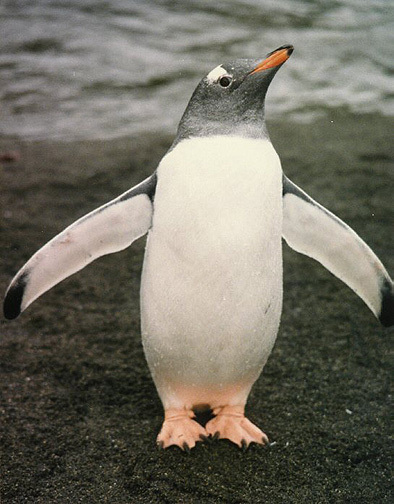 The gentoo penguin is classified as Pygoscelis papua, the Adélie penguin as Pygoscelis adeliae, the jackass penguin as Spheniscus demersus, the Galapagos penguin as Spheniscus mendiculus, and the Humboldt penguin as Spheniscus humboldti.